Shingles is a condition of nerve and skin inflammation that occurs as a result of infection with the varicella-zoster virus, usually after the age of 60. This is the same virus that causes chickenpox, usually in children under the age of 15. For decades, the varicella-zoster virus hides deep in the knotty ganglia of the sensory nerves for the skin, at the end of the nerve nearest the spine. As long as the immune system "remembers" how it finally defeated the virus during the chickenpox infection, it can keep the virus bottled up with the nerve cell's DNA. If the immune system ever "forgets" how to fight the virus, however, it can begin to replicate itself and to travel along the nerve to the skin. The cause of immune compromise that lets the virus escape is usually stress, but surgical removal of the thymus (where white blood cells are "taught" how to fight infection), chemotherapy, physical injury to the nerve, HIV, lymphoma, kidney cancer, use or abuse of steroids, and certain other viral infections can initiate shingles. The inflammation of the nerve can cause flu-like symptoms that are relieved by rest. Depending on which nerve or nerves are affected, there can be dizziness, queasiness, changes in taste or smell, burning, itching, or shooting pain, usually for two or three weeks before the actual emergence of blisters. Cannot give anyone else shingles, since shingles develops from the inside out along the nerve. Can give someone else a varicella-zoster virus infection, but this will cause chickenpox, not shingles. Shingles is not contagious in the form of shingles. Shingles is contagious in the form of chickenpox. People who have ever had chickenpox-and that is most but not all people who were born before 1995-won't catch it a second time. Children who have been vaccinated for chickenpox will not catch any viral infection from a person who has shingles. People of any age who have never had chickenpox, however, can catch chickenpox by direct contact with the skin, scabs, or secretions of a person who has shingles. How Can You Stop Infections from Shingles? The transmission of the virus that causes shingles has been researched in nearly 500 scientific studies. One of the more important findings of the research is that a lot of the transmission of the varicella-zoster virus from people who have shingles blisters to people who have never been infected before occurs in hospitals and nursing homes. Bed linens and wash clothes accumulate the oozing secretions from the blisters and damp crusts that can infect unsuspecting personal care aides, laundry personnel, cleaning personnel, and visitors. In one rest home, a single resident who had shingles infected three other residents who had never had chickenpox. Any time the blisters are exposed to the open air, the virus can be transmitted. Even covering the blisters with gauze does not completely stop the transmission of the virus. The varicella-zoster virus can be found in saliva, but researchers believe that the virus gets in saliva by being inhaled from the skin. The mouth and salivary glands are not infected by the shingles virus. And perhaps the most important finding of shingles research is that nowadays most cases of chickenpox are acquired from people who have shingles, not people who have chickenpox. Limit contact with anyone who (1) has not had chickenpox (people who have ever had chickenpox will not catch the virus from anyone who has shingles) and (2) has not been vaccinated for chickenpox. Cover blisters at least with gauze, or with a loose-fitting bandage, edges placed outside the area of skin affected by blistering. Do not help a person who has active blisters caused by shingles with bathing or grooming unless you have had chickenpox or you have been immunized. Do not share wash cloths and towels with a person who has shingles. Launder towels, bed linens, and clothes in hot water. Do not share a bed with a person who has shingles. Don't scratch blisters. This opens them to infection, and releases crusts and dead blood cells that can carry the virus to others. Wash hands frequently, even when you do not remember touching blisters. The very best way to prevent the spread of the varicella-zoster virus, however, is to accelerate healing of the blisters. I don't ever recommend that anyone stop taking a medication that works. If you are taking acyclovir (Zovirax) for blisters, however, it also helps to take a few drops of oil of cloves in about 1/4 cup (60 ml) of warm water every time you take the medication. The combination of oil of cloves, which is more commonly used to treat toothache, and acyclovir works better than acyclovir alone. Oil of cloves without acyclovir has no effect on shingles. There are also three herbs that help blisters heal faster. The best known of these is lemon balm, sometimes labeled by its botanical name Melissa officinalis. This herb has been clinically tested as a treatment for herpes. There haven't been any clinical trials of which I am aware testing lemon balm as a treatment for shingles, although my readers who have had shingles who used lemon balm creams had clear skin in 3 or 4 days. 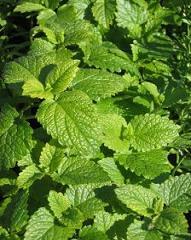 Lemon balm can be applied to the skin, or taken as an herbal supplement. Another herb that can be helpful with skin inflammation is purple coneflower, also known as Echinacea purpurea. This herb contains complex sugars that act like a key that fits into certain "locks" on the surfaces of white blood cells. These complex sugars stimulate phagocytosis, the removal both of injured cells and also of bacteria. Shingles is not caused by bacteria, but bacteria can cause painful secondary infections when shingles have broken the skin. Echinacea also relieves pain. The third herb that is often used for viral skin infections is skullcap, sometimes known as "scute," or by its botanical name Scutellaria. There are species of skullcap native to the United States and also species of skullcap native to eastern Russia and northern China. Skullcap is a classical "nervine," calming nerve activity. If you have shingles, calming your nerves does more than establish a happier emotional state. Lower metabolic activity in the nerve results in lower metabolic activity in the virus. With the use of skullcap, you may be able to reduce the severity of the prodrome, the symptoms that occur over 2 or 3 weeks before blisters break out, and you may also be able to reduce the severity of post-herpetic neuralgia, the stabbing pain that persists even after blisters heal over. You could buy each of these herbs separately, but it is less expensive and more efficient to use a combination product like Chikkie Spot Drops (taken orally) and Chikkie Spot Soother (applied to the skin) by Native Remedies. Even though they are marketed for children, the formulation is ideal for older adults who have shingles. The products don't eliminate shingles, but they can take several days off the healing time. Q. Does weather have anything to do with the spread of the virus from shingles to uninfected people? A. When the air temperature is over 30°C (86°F), the virus is four to five times less transmissible than it is at 20°C (68°F). Of course, if you are staying inside an air conditioned house, the virus will still be transmissible. But meeting outside on the patio or by the pool or in a park during summer will result in fewer transmissions of the virus, at least in warm climates. Q. Are there any psychological factors related to shingles and spreading the virus? A. Lower levels of psychological stress are associated with lower levels of shingles symptoms. As far as I am aware, no researchers have looked at the question of whether an elderly person who has never had chickenpox is more or less likely to catch the virus from another elderly person who has shingles under conditions of stress.